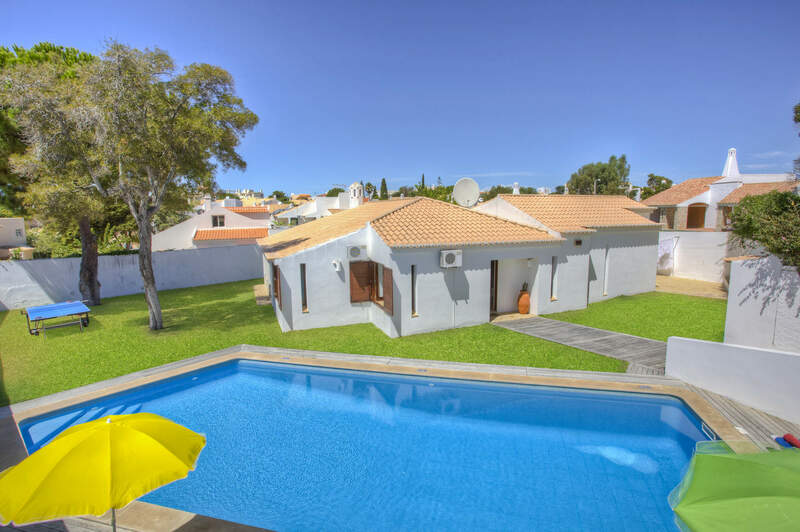 Villa Oura has a large private pool coupled with a great central location just a few minutes' walk of Praia D'Oura's famous Strip. This lively resort has all manner of amenities and a beautiful, expansive golden beach. Neighbouring Albufeira is only 5 minutes away by car with its marina, old town, beach, restaurants and shops. Air conditioning/heating in the bedrooms, pool heating and WiFi are included in this 3 bedroom villa. The fabulous central location and your own large private pool. Great for a lively holiday! The large pool is surrounded by decking with lawns on 2 sides. It's a great place to relax on one of the sun loungers with a cool drink. There is a dining table with chairs on the covered terrace, which also has smart columns incorporating further seating. This area along with the brick BBQ provide the perfect combination for dining alfresco in true Portuguese style. There is ample parking outside the villa on the street for your cars if you choose to hire them. The gates open on to a sloped cobbled pathway and decking area leading to the front door. The bright and spacious lounge has comfortable sofas, a flat screen TV, a feature fireplace and attractive terracotta flooring. Patio doors open on to the covered dining terrace and ensure that plenty of light flows into the room. The fully equipped kitchen/dining room is 1 step down from the lounge. It has a dining table with chairs where you can enjoy a hearty breakfast. There is a door outside to the brick BBQ. There is 1 double bedroom and 2 twin bedrooms, all sharing 2 separate shower rooms. All bedrooms have use of their own fitted wardrobe. This villa has applied for a licence and the submission number is 450.10.33/2015/499. The licence number will follow. Villa Oura has an enviable location in the heart of Praia D'Oura on a residential side street with shops, bars, restaurants and nightlife all a short walk away. What's more it's ½ mile from the beach at the end of the Strip, or 5 minutes in the car from the neighbouring resort of Albufeira. This popular resort has a whole host of amenities and an expansive sandy beach to enjoy. What's not to love? There are a range of shops to choose from in the resort centre within walking distance from this villa. A local market runs every Tuesday between Praia D'Oura and the old town of Albufeira. The older part of Albufeira is ideal to get a taste of the past with narrow streets, handicraft shops and traditional Algarvean colours. There are wide shopping streets and a lively atmosphere particularly in the large square with live music featuring at times. Praia D'Oura Strip has everything you need, with all manner of cafes, bars, restaurants and clubs to sample. By day enjoy lunch at any one of the cafes and restaurants. By night Praia D'Oura really comes to life, with many of the bars and clubs offering a great atmosphere and opening until the early hours in high season. Plenty of restaurants are on offer in neighbouring Albufeira too. The Strip runs all the way to the golden sandy beach from which Praia D'Oura derives its name. Water sports facilities plus a choice of beachside cafes and restaurants are all on offer. Albufeira is a short car journey away and is a beautiful and expansive sandy beach, flanked by dramatic cliffs and rock formations. For a more relaxed atmosphere, to Albufeira's far side there are a string of picturesque cove beaches, such as those at Coelho, Castelo and Gale. A little further afield, 15 minutes' drive on either side of Albufeira, are the sandy stretches of Praia Grande to the west and Falesia to the east. A choice of water-parks and the Zoomarine aquarium and dolphin show are within a short drive - all a big hit with young children, teenagers or even the adults in the party. Alternatively, Parque Aventura is situated in Santa Eulalia, Albufeira and consists of a paintball centre and various adventure courses through the trees made up of zip wires, bridges and ropes. The assault courses and games are suitable for children of 4 years and older with varying degrees of height and difficulty. For golfers, the 9-hole Sheraton Pine Cliffs and Balaia golf course are nearby in Olhos D'Agua. Alternatively, there are 6 full, championship courses at Vilamoura to choose from. Villa Oura is not available to book for season as it is sold out. Take a look here at the Algarve villas that are currently on sale. The villa was in a great location, in a small cobbled and quiet street only a few minutes walk from the shops, bars and restaurants on The Strip. Despite being so close to everything there is no problem with noise at night. The villa is spacious with good sized rooms and a lovely big kitchen. There is a small supermarket within a 5 minute walk of the villa and the Pingo Doce Supermarket is a 15 minute walk away, which has a butchers, fishmongers and bakery. We didn't hire a car so got a bus (1 stop) to the large Continente Supermarket which has a taxi rank outside so you can really stock up with everything you need - taxi home was only 5 Euros. Villa was ideally situated, clean with large pool, table tennis and pool table which was an added bonus along with the Wi-Fi. If you are looking for privacy within easy reach of the strip this is the one. Would certainly go again. Absolutely brilliant such a lovely villa in a great place already booking for next year. No suggestions as very pleased with villa plus! Our second time of using this year and have already booked villa for next year! Thanks for a great service.